This section provides a tutorial example on how to use java.swing.SwingWorker class the JProgressBar component on the UI. All main features of the SwingWorker class are demonstrated. 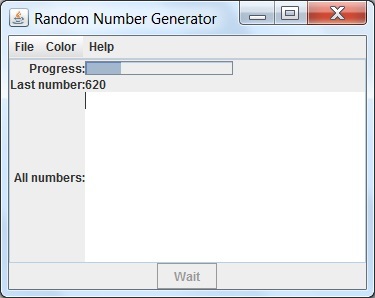 Example 4: Put everything together - This example shows you how to all features of the SwingWorker class together to create more real Swing GUI application to generate random numbers as a background task. * Copyright (c) 2014, HerongYang.com, All Rights Reserved. Note that while the random number generation is going on in the background, you can still click on menu items to perform other functions. This demonstrates us the key advantage of using the SwingWorker class, i.e. to launch a time consuming task in the background and keep the UI to be responsive. Sample programs listed in this section have been tested with JDK 1.6.0 to 1.8.0.